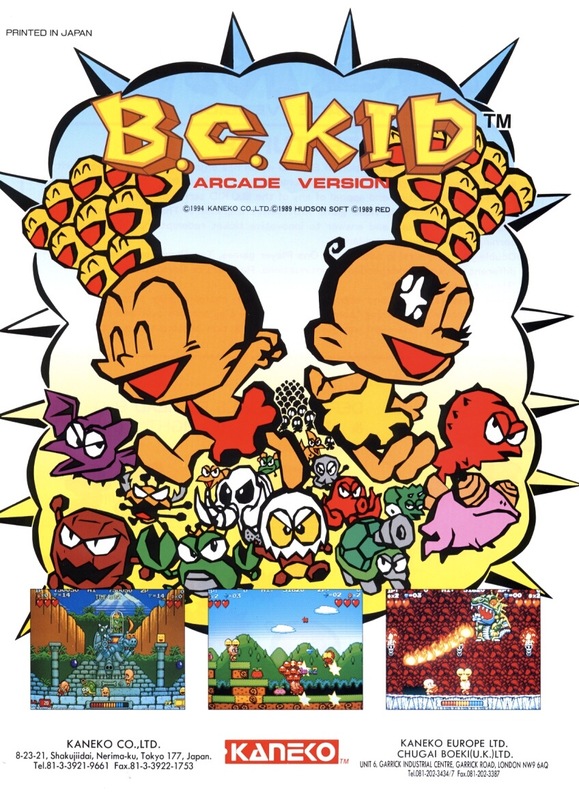 Like any good Bonk--or, PC Genjin, as he's called in Japan--fan, I consider the character's PC Engine outings to be (basically) the only ones worth my attention. As a result, I've ignored pretty much all of the spin-offs that have been released for the GameBoy, the Famicom and the Super Famicom--I'm just going to ignore the later atrocities--over the years. 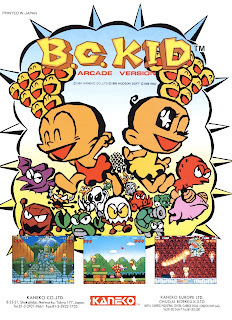 I haven't ignored all of the Bonk spin-offs, though; the arcade-only BC Kid, for instance, has always intrigued me despite the fact that it was developed by Kaneko rather than Red and Atlus. Artist and blogger Curtis Bathurst seems to share my interest in BC Kid, at least as far as the game's aesthetics are concerned. In a recent post, Bathurst critiques the game's promotional art (right) as well as its in-game graphics. Although he isn't a big fan of either, he ends his post on a positive note saying, "I find it wildly exciting that there was ever a coin-op Bonk’s Adventure and I love rummaging through the ‘net in search of bits and scraps about the game." If you're at all interested in graphic design--especially as it relates to the world of gaming--I highly recommend heading over to Bathurst's site and reading his post about this quirky quarter-muncher. I may. Thanks for pointing the way! I went and checked him out, and...LOVE IT! What a cool blog. Oh, I'm glad you liked it! I think Curtis will be happy to hear it, too. He recently said (via Twitter) that I've inspired him to continue posting, so here's hoping he sticks to that plan!